Here is the graduation card that I made for my nephew's graduation from high school. The colors are Night of Navy and Gold (as close to his school colors as I could get). The paper on the bottom is Stampin' Up! 's new "Presto Patterns Specialty paper" (pg. 15 in the Summer Mini Catalog). The paper looks only white when you get it, but this was brayered with Night of Navy ink to get the pattern to "pop". It is SO cool to do! Like magic! 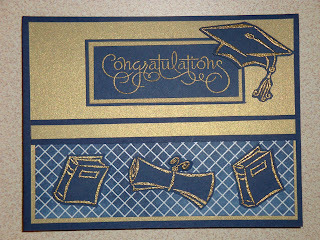 The graduation images are from a retired stamp set "Tassel Time". This is one of those stamp sets that I have kept in my stash for when I need it - like now. All of the images are stamped with VersaMark ink on Night of Navy card stock, embossed with gold embossing powder, and then cut out. 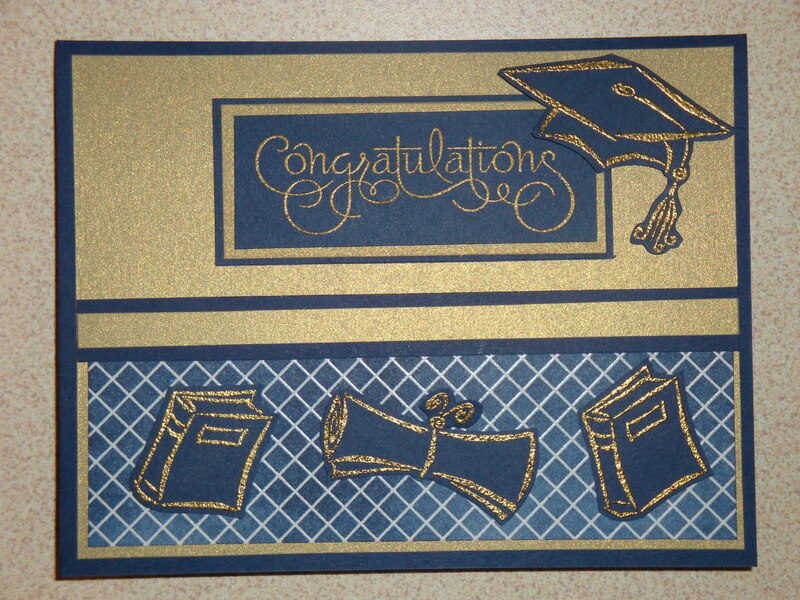 The graduation cap is popped up with Dimensionals but the other images are simply adhered using SNAIL adhesive. The "congratulations" is from "Well Scripted" which was a stamp set available in the last mini catalog and I hope is in the new Stampin' Up! catalog. All in all, I was pretty pleased with how it turned out - and it was actually fairly quick to make! Are you coming to my new catalog open house? Only Ten Days Left for $99 Starter Kit Special! I'm still here - and fabric flowers!